Berkhamsted FC's Jonathan Lacey. (File picture by Ray Canham). 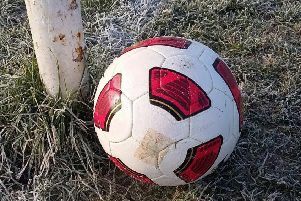 A 1-0 defeat at lowly Kidlington on Saturday might prove costly to Berkhamsted FC’s playoff hopes. 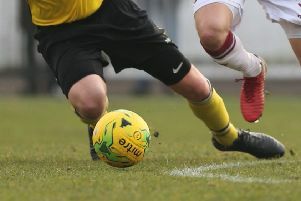 Kidlington moved out of the dropzone with the win, while Berko are now three points and four places adrift of the fifth and final playoff spot in the Southern League Division One Central. Berko boss Steve Bateman made one change from the team that won at Cambridge last week, bringing back record appearance-holder Lewis Rodrigoe at the heart of the defence. In the first-half the hosts had the wind, making it difficult for Berko to clear, with high balls catching the fierce gales and bringing them back to the kicker. Losing possession just outside the box as the ball bounced led to Declan Benjamin claiming it and running onto goal with a shot that proved to be the only goal in the 10th minute. At the other end Jonathan Lacey, Cameron Brooks and Andrew Ofuso got behind the defence but the Kidlington backline and net man Sam Warrell kept them out. Berko had the wind advantage in the second-half and forced many corners, with young Martyn Box supplying a steady stream of dead balls, but apart from one powerful header just over the bar from Ryan Kinnane, the defence managed to clear the danger. The defeat may prove to be a real setback in Berko’s playoff chase but they were due to be back on the horse last night (Tuesday) when visiting London Colney in the Herts Charity Shield quarter-final. On Saturday they hope to get a bumper crowd when hosting fourth-placed Didcot Town as it is an international break for top sides.